Phil Dale has over 20 years of experience working in the animation industry and is considered one of the leading stop motion animators of his generation. Working as an Animator and a Director, he always brings true magic to his projects. He is a member of the Liaka Animation Studio, and his work has been demonstrated through many award winning commercials, music videos, short films and features films. He specializes in Stop Motion Animation, Story Development and Screenwriting. You may have heard of some of his endeavors, such as……….The Boxtrolls, CORALINE, The Tale of Despereaux, Corpse Bride, ParaNorman and The Periwig-Maker to name a few. 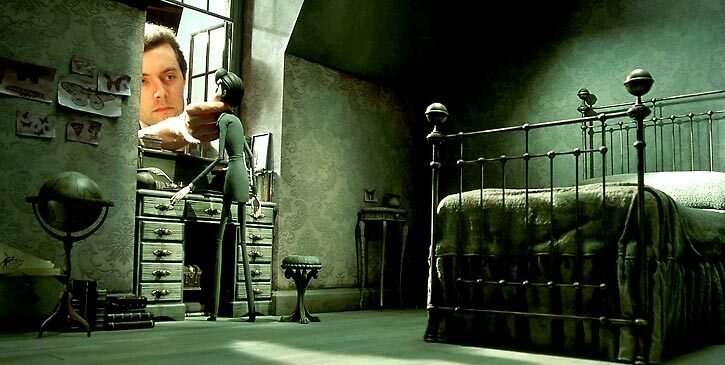 Animator Phil Dale working with Victor Van Dort on the set of Corpse Bride. If you follow Phil Dale on Instagram (@Handmation), he recently shared a sneak peek of a special and exciting upcoming collaboration with Maribel Diaz (@Voo_dooLady) and her Custom La Chica Del Lunar Custom Blythe, Cobain. Cobain is an overall wearing, grunge guitar playing, Teddy Bear loving, little girl who has thus far been magically brought to life through the lens of Maribel’s camera. Now we will have the opportunity to see her little spirit come to life with the enchanted help of Stop Motion Animation! There is such character, warmth, beauty and magic in stop motion that completely fascinates me. So to see an animator of his caliber showing interest in bringing Blythe to life, well that thoroughly peeks my interest to say the least. I needed to know……Why Blythe? She truly enchants me and all of the others in our community worldwide, but why? A creative mind such as Phil Dale could create any character in his mind from scratch; why choose our little Blythe to bring to life? So, since he follows my Instagram Feed (@MyDeliciousBliss), I simply reached out to him and asked, he was gracious enough to oblige, so here is what Phil Dale had to say about Blythe……. A: “I stumbled across the world of Blythe via Instagram a couple months ago. Until then I had not really been aware of it, but I was immediately intrigued by the gorgeous custom dolls that I saw. With a little digging, this large creative community came into view that I found fascinating. I think it was the convergence of craft, photography and a sense of storytelling that seems to be part of the tradition of Blythe that really drew me in. That, and the fact I really like the proportions of dolls, the large eyes have the potential to be very expressive, and the custom faces are full of character. It seemed like there was a lot of common ground between this community and the world of stop motion animation. So I just got a sense there was potential within this community for me to find a place of my own within it. I don’t quite know what that place is yet, but the best way for me to explore Blythe is through the medium I know best, animation. Maribel (voo_dolady) has been helping me understand the Blythe world and answering my questions. I’m not sure where the collaboration will end, or what doors it might open, but I’m already learning. Who knows, maybe there is a market for collectors and creators to see their dolls come to life? Or maybe there are some ideas from the stop motion world that can be incorporated into new customizations for dolls! I don’t know, but it will be fun finding out. Cobains' arrival at Phil Dale’s studio had him already rigging her Kinetic Armatures. Mocked up in an animatable eye rig. As with the entire Blythe Community and Stop Motion fans alike, I am sure we are all looking forward to seeing more progress and evolution of this wonderful collaboration! I would like to welcome Mr. Dale to the Blythe Community and thank him for his time and for being so wonderful.